Nuki lock screen widgets and the 3D touch shortcut allow you to access your Smart Lock even faster now. The Nuki actions widget lets you carry out any locking actions for your Smart Lock directly and in the blink of an eye. Only up to three Smart Locks will be displayed in the widget. Please bear in mind that only those Smart Locks that have been set as favourites in the Nuki app will appear in Nuki widgets. The Nuki lock widget shows up to four of your favourite Smart Locks next to each other in an orderly and space-saving view. To access your Smart Lock, simply tap the relevant Smart Lock in the widget, and it will be opened in the Nuki app. 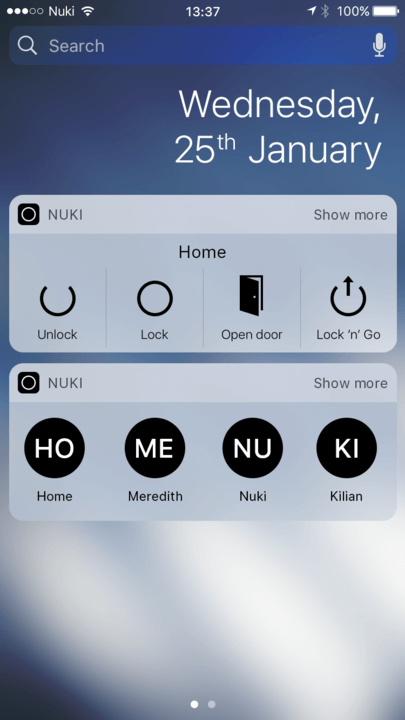 By firmly pressing on the Nuki app symbol on the lock screen, the action list of the first Smart Lock appears, which has previously been set as a favourite in your Nuki app. This is where you can quickly access the available locking actions of your Smart Lock. The Nuki widgets only show widgets that were marked as favourites in the Nuki app. To set a Smart Lock as a favourite, tap on the Nuki app and select the desired Smart Lock and open the lock settings. This is where you have the option to mark you Smart Lock as a favourite. To change the order of your favourite Smart Locks, open the app menu in the Nuki app (top left), and go to “Favourites”. Then, hold down the Smart Lock in order to drag & drop it. The top Smart Lock will be displayed first in Nuki widgets. Please note: You will require iOS 10.2.1 (or higher) to be able to use widgets. You can learn more about using widgets on your iPhone, iPad, and iPod touch here.